The 1917 Chicago White Sox were a strong team, one of the best to play baseball in the dead ball era. In addition, its players are no doubt some of the most famous—as it was essentially the same team as the 1919 Black Sox. 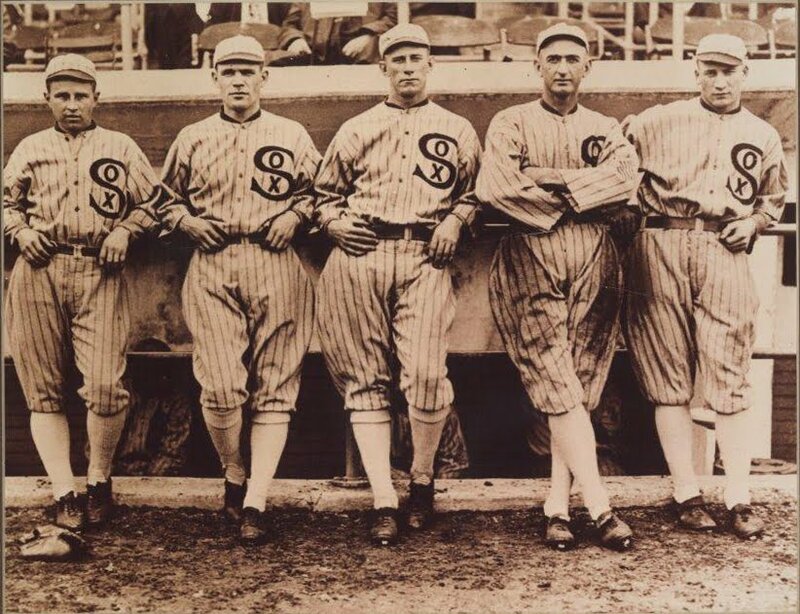 These White Sox would go on to win the 1917 World Series, beating John McGraw's New York Giants. But before any of this occurred, the 1917 Sox would play at Borchert Field, of course, before it was called Borchert. It was not uncommon for major league teams to play exhibition games during the season in various cities on off days. 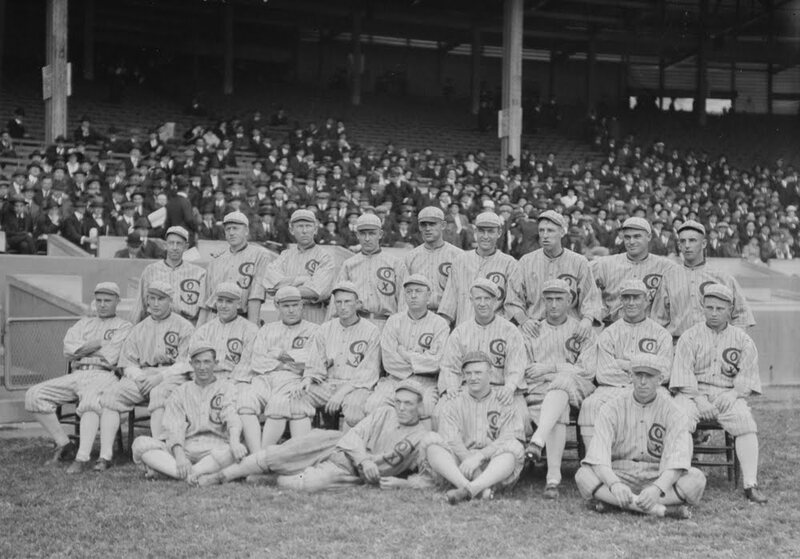 Due to a schedule quirk the White Sox were off four straight days toward the end of the 1917 season. 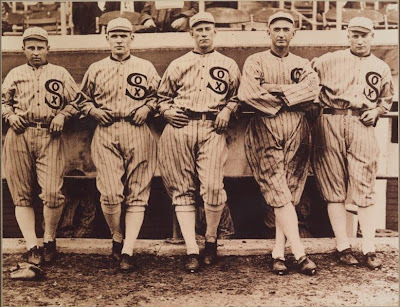 With the team solidly in first place, Sox owner Charles Comiskey decided to play a few exhibition games to keep his boys sharp, and no doubt bring in a few extra bucks. 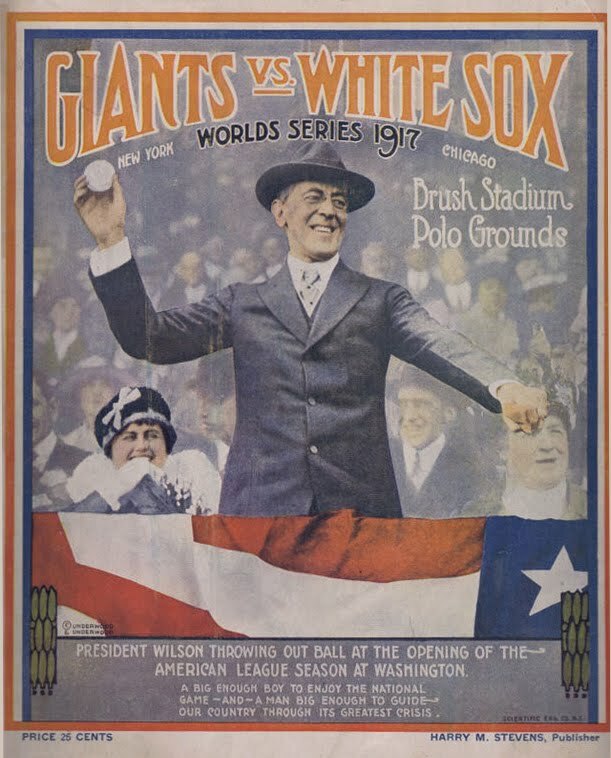 The White Sox would play in Beloit, Wisconsin, on September 10, wining 5 to 4 in a hard fought game before 3,500 fans. The Beloit squad made three errors in the first inning, allowing the major leaguers to score three runs, before settling down. The next day the ChiSox beat a Fort Wayne, Indiana, team made up of minor leaguers, by a score of 7 to 2. Manager Clarence "Pants" Rowland then brought his White Sox to Milwaukee for a September 12 game. Owner Comiskey had arrived in Beer City the previous day. 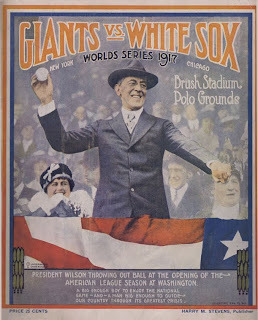 The game had been hyped in the press for a few days, not only because the American League champs would make their appearance, but because of the Milwaukee connection of at least three players. Nemo Leibold had roamed the outfield with the Brewers in 1911 and 1912, and was said to have been one of the most popular players in a Brewers uniform. White Sox catcher Ray Schalk, known as the best catcher in the majors at that time, also did his apprentice work in Milwaukee in those same years. But by far the main attraction was Oscar "Happy" Felsch, the White Sox center fielder. The 26-year old Milwaukee native had played with the Brewers in 1913 and 1914, before being purchased by the White Stockings. 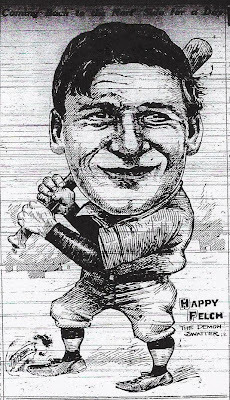 "Hap" was now a major league star, the Milwaukee Journal bragging he was hitting "the bulb at a .318 clip and it has been his clouting that has put the Sox in the race." The Milwaukee American Association Brewers were in Columbus, Ohio, on September 12, losing a doubleheader 6 to 0 and 12 to 3. That Wednesday afternoon in Milwaukee 6,000 fans turned out at Athletic Park on 8th and Chambers to cheer on the Sox against a team of all-stars selected from local and state teams. The starting pitchers for the contest were announced as Claude "Lefty" Williams for the White Sox and Sheboygan spitballer Alfred "Buster" Braun for the All-Stars. Braun also had a Milwaukee connection, having pitched for the Brewers in 1913 and 1914, winning 16 and losing 12 in those two years. Braun was now a mainstay with the Sheboygan Chairs, leading them to the Lake Shore League pennant in 1916 and 1917. Manager Rowland started his regulars, thus the Milwaukee fans got a chance to see "Shoeless Joe" Jackson, Eddie Collins, Chick Gandil and Swede Risberg, in addition to Felsch and Schalk. Leibold did not play, Eddie Murphy playing right field. Also out of the line-up was third baseman Buck Weaver, nursing a broken finger. His position was being filled by Fred McMullin. The soon to be World Champs opened up on the All-Stars in the first inning with three runs. Eddie Murphy started the game with a walk, followed with singles by Eddie Collins and Joe Jackson. As Happy Felsch came to the plate some of his north side friends presented him with a bouquet of posies. The Milwaukee native responded by "soaking a double to the suburbs." The Sox scored three more runs in the second inning on a three run blast by Eddie Collins. Shoeless Joe followed with a triple, but was stranded on third base. The All-Stars managed a run off Lefty Williams in their half of the second inning, beginning with a walk to first baseman Henning. Future hall of fame catcher Ray Schalk then tried to pick Henning off first base, but threw wild, allowing the All-Star runner to advance to third base. Second baseman Braby singled him home a batter later to cut the Sox lead to 6 to 1. 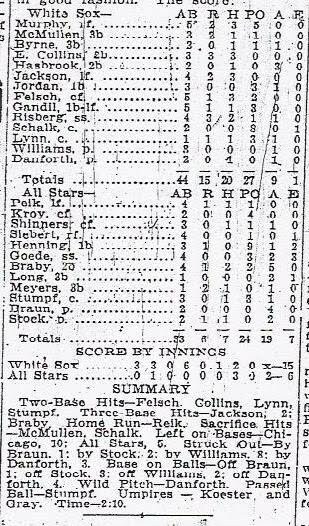 But six runs in the fourth inning by the Chicago men spelled the end for the Sheboygan star Braun. 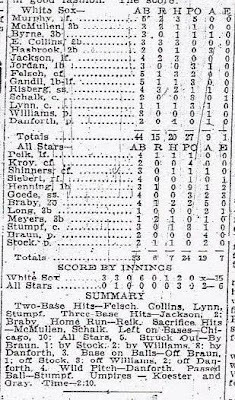 After the fifth inning Rowland changed his entire team, either by rotating positions or taking his stars out of the game, except for keeping hometown hero Felsch in centerfield. This second string line-up still managed to score three runs off pitcher Stock. "The wallop cleared the left field fence by several feet and boosted Mr. Reik to a position of great prominence on the south side. In fact, Jake Litz already has Connie's noble countenance painted on the mirror behind his bar." [City directories of that year show Jac Lutze owned a saloon on the northwest corner of 6th and Arthur, and his son Jac Lutze Jr. owned a saloon at 801 West Mitchell Street.] The All-Stars managed to score two more runs in the ninth, to end the day on the wrong side of a 15 to 6 score. The later famous (and infamous) White Sox players had a pretty good afternoon. Eddie Collins went 3 for 3, scoring three times, including the second inning home run. Fred McMullin had one ht and scored two runs. Joe Jackson had 3 hits in his 4 at bats and scored 2 runs. Hap Felsch went 3 for 5, scoring one run. Chick Gandil had only one hit in 5 at bats, but Swede Risberg went two for four and scored three times. Ray Schalk went hitless and had the Sox only error. Lefty Williams pitched well in his five innings of work, but the "demon rescuer" Dave Danforth "either did not have his fireman's clothes on or he took it easy, for the fresh young bushers took considerable liberty with his stuff," according to the Milwaukee Sentinel. "The luster of the Milwaukee All-Stars was considerably dimmed by the time the batfest was over, but the fans at least had the pleasure of watching the American league leaders in close-up action."